On grant applications I check the box next to - Artist. It never occurred to me to select – Art Collective. But, perhaps I should. I never work alone. My collaborators just don’t happen to be human. Early on I raised my colleagues – fed them, housed them, cleaned up after them. The dialogue was between me and the cockroach, me and the praying mantis, me and the frog. Now that I work with leafcutter ants in Costa Rica that model has morphed into something else. I am on the outside peering in at a true cooperative team with millions of members. Leafcutter ants constantly jabber to one another – antennae touches, vibrations, and pheromones. It’s non-stop text messaging. Twitter on steroids. Scare one ant and it screams, not with sound, but with a scent trail of fear. Her mates refuse to walk on that spot. 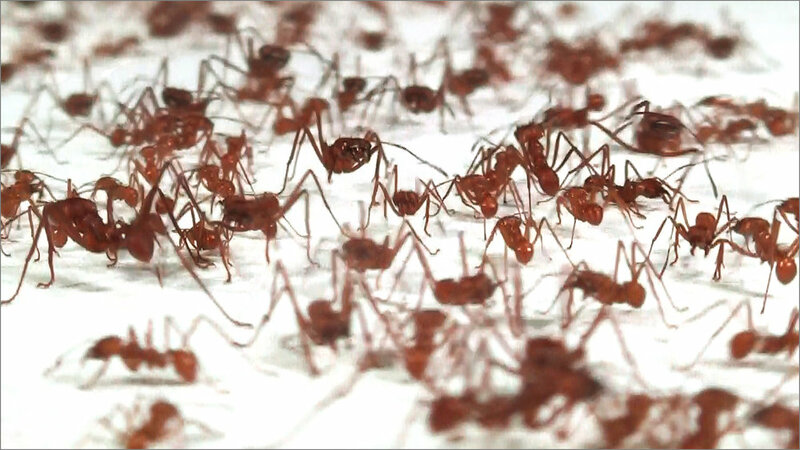 Ants invented a sophisticated, networked communication system that rivals the Internet. Without central command – individual antennae touches are like Google hits – complex decisions are made. At some point a message goes viral. If only I could write an algorithm to better decipher the data. Yesterday was a rough day. I worked for hours to persuade the ants to enter my set stage right. Because of some hidden data that was clear as day to them, they insisted, in mass, on entering stage left. I felt like they shared the same Facebook friends and I wasn’t even online. Today I hope will be better and maybe the term Art Collective will even apply.